The project involved severing a parcel of land from an existing 'double-wide' lot in an urban area, to create a new single family home that would blend with the existing neighbourhood but be unique to the owners style and values. The exterior of the home is clad with an iron coloured brick, and clear cedar siding and soffits that provide a clean modern look, and will tell a story of it's age, origins, and use over time. The windows are black aluminum in-swing and tilt/turn. The garage was strategically placed to minimize the height of the 3 storey home, and to allow elements other than the garage to be prominent. It also allows for an open concept main level for the kitchen, family room, living room and dining room. 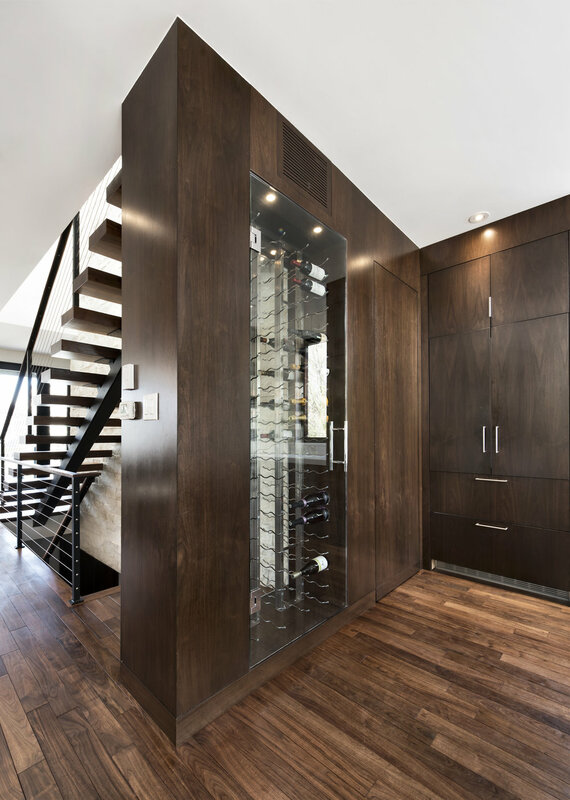 As you enter the front door you are greeted by a dramatic open riser stair case which you can see through to a built-in wine storage. 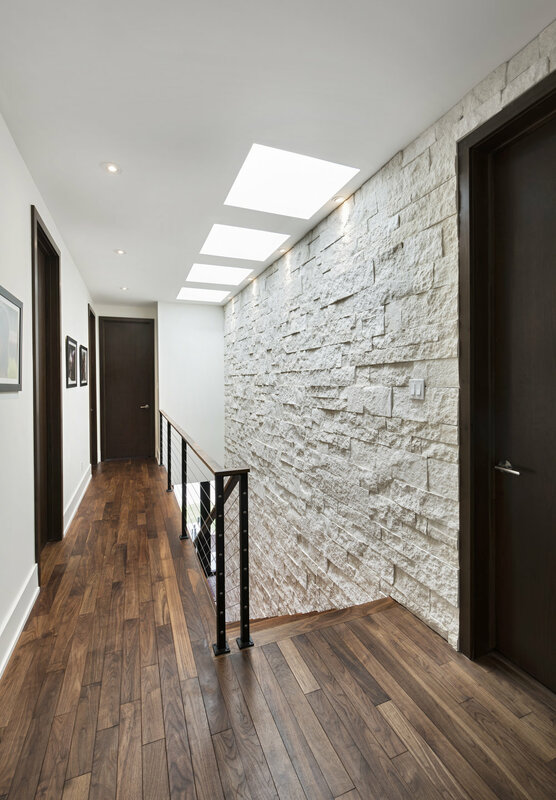 A stone wall on one side of the stair leads your eyes up to the skylights above that cast shadows that move throughout the day. The open concept main floor is perfect for entertaining and every day family life. From any point on the floor you can see every room, but each space is still well defined. The folding glass doors in the family room open up to a partially covered deck, and blurs the line between indoors and out. On the second floor there are 4 bedrooms, 3 bathrooms, and a laundry room all on a relatively small footprint using smart space planning. The basement level has 2 walk-out access points, as well as access to the garage. When entering through the garage you pass through a mudroom area and wine cellar with glass walls. The end result is a timeless design that reflect the owners modern lifestyle, and is flexible to adapt to change over time.